New Orleans is one of the most unique cities in the United States. As the birthplace of jazz, the best city for Mardi Gras, and the home to tons of swampland, it’s hard to find anywhere like the Crescent City. Naturally, we have tons of tourists year-round to see all we have to offer. Many of these visitors would also love an “authentic Cajun experience.” But what does that really entail? To find some authenticity—and some fun!—look into an airboat ride with Airboat Adventures. Our smaller airboat fits 6-8 people. This boat choice provides a faster boat and a more intimate tour experience. This tour is $79 per person with an additional $20 for optional hotel transportation. Our larger boat is for bigger families and groups, sitting 15-30 people at a time. This tour is $55 per person. Our optional hotel roundtrip remains $20 for those staying in New Orleans. Each tour lasts an hour and 45 minutes. This is to give you plenty of time to take in all the sights and sounds of the swamp. Additionally, children must be over the age of 5 to be able to ride on the airboat. We understand your disappointment, but this is for their safety. Once they’ve grown in a few years, we’ll be sure to welcome them with open arms! 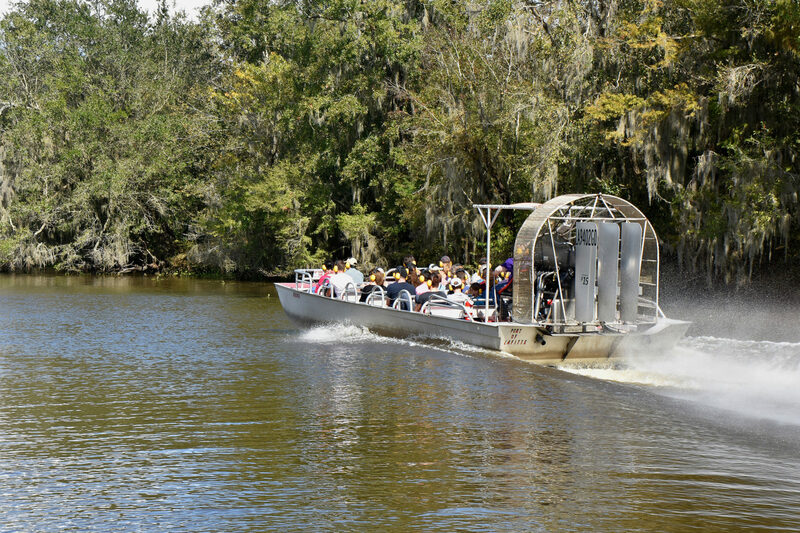 At Airboat Adventures, we have three tour times that are the same year-round: 9:45, 12, and 2. However, once the water begins to warm up in the summer sun, we offer two more tour times at 4 p.m. and 6 p.m. We offer these additional times for more reasons than you’d think. The first is because the summer brings more sunlight to navigate the swamp safely. The second reason is the summer months are some of the best to visit! As the swamplands warm up in the summer sun, more and more flora and fauna become active during the day. Especially our most famous resident reptiles: the alligators! Make sure to contact us as soon as possible for the best airboat rides in New Orleans! You can call us at 504-689-2005 or email at Info@AirboatAdventures.com, if you have any questions. After you book your appointment, we can be found at 5145 Fleming Park Rd. in Lafitte. We’re coming up soon on our seasonal times, so make sure to schedule before all the seats are gone! Summer truly is the best time for the swamp and her creatures, so you’ll really see the lands at their best. Book today for the best airboat rides around!